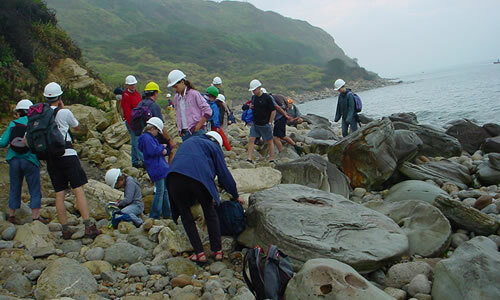 Our field trips cover most areas of the country looking at coastlines, mountains, quarries, landforms and everything else in between! As well as trips around England we also organise an annual weekend to Wales every year. We learn to identify regional and local geological features. We learn simple geological mapping techniques and how to understand changes through geological time using evidence we see in the field. We explain the importance of carefully recording your finds (fossils, rocks or minerals) for subsequent identification while stressing the need not to over-collect in the interests of geoconservation. While many of our field visits include some fossil collecting, others might explore building stones in urban and country areas. We show you how it is the geology that underpins the local distinctiveness of buildings in areas such as the Cotswolds with its honey-coloured Jurassic Limestone or East Anglia with its flints. We are also privileged to visit ‘behind the scenes’ of many of the country’s museums, learning the skills of a curator and seeing specimens not usually on view to the public.